Join the Trollgod's Elite Champions! The Trollgod is starting a secret club with an exclusive membership. You have to pay $10 to get in. Because this is going to give you access to great stuff that nobody else in the world has a shot at. Also, because this club is going to be the means of publishing Ken's 6th edition Tunnels and Trolls if Flying Buffalo doesn't have the cash this year. 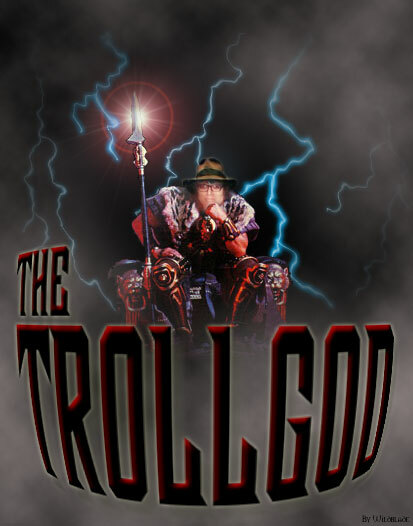 And because you believe in the Trollgod, and want to be part of his Elite Trollish strike force. Your name and address on Ken St. Andre's Christmas card list. A genuine fake gold piece. Occasional free things--mostly fantastic in nature. Access to special T & T materials that the rest of the web simply won't ever know about unless you tell them. A chance to get the Trollgod's treasures for bargain prices. Rated as a Trollish Champion in the Trollgod's Elite Force. The satisfaction of knowing that you're helping to build up a publishing fund for future T & T publications. Frequent updates of the true url for the club's functions. This page is just for recruiting. You can't get to the good stuff from here. More stuff as I think of it, like Trollworld fiction, auctions, swapmeets, puzzles, news, rants and raves. Once upon a time there was an ancient Trollgod who had spent his life accumulating fabulous treasures. After his fifth century, he noticed that he was beginning to weaken, and that his treasure cave was packed to bursting with more treasures than he could even count. Not only that, but new treasures continued to arrive from all over the world, from his many minions and shrewd investments. Of course, what a Trollgod considers to be treasure might be considered trash by an ordinary mortal, but to those of true discernment, there were many magical Tomes, Toys, Talismans, and Trinkets spread about the dark cave. "It seems a shame," said the Trollgod one evening to the old wizard Khazan, "that all of these treasures should just be wasted and gather dust in this cave." "That's a very untrollish thing to say," commented Khazan. "You could give them away, you know." "Sometimes I do that," growled the Trollgod, "but not often. Have you ever noticed that people do not value things that are too easily obtained? I had to work, adventure, and risk my life many times over to gain these treasures. They mean something to me, but if I give them away, they won't mean anything to the recipients." "Quite true," said Khazan. "Well, then, you should keep them." "Just look at this cave," said Trollgod. "I hardly have room to sit down, and new treasures are coming in all the time. I have had my pleasure from the older things, but I don't want to throw them away." "Then you should sell them," said Khazan. "That way the new owners would have to sacrifice something of themselves to gain the treasures, and they would value them accordingly." "Or you could create quests and puzzles, and only those who solved them could win the treasures," suggested the old Elf. "Yes, that could be most amusing," agreed the old Troll. They sat in silence for a while, basking in the effulgence of the many Tomes, Toys, Talismans, and Trinkets that surrounded them. A great grin grew on the Trollgod's grisly face. "Yes, that is exactly what I will do," said the Trollgod. "Only those who are worthy and really want them shall have my treasures. They will have to quest for them, and win them with both wit and wealth." 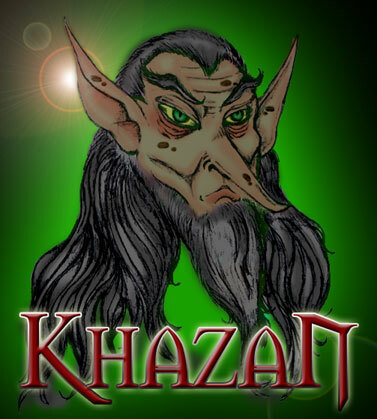 "This should be fun," said Khazan. "I hope so," said the Trollgod. "I certainly hope so!" You know what you have to do. Once you have joined the Trollish Elite, further instructions and opportunities will be presented to you.